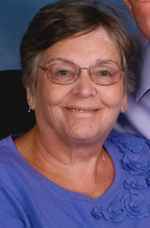 Elizabeth N. “Liz” Corey, 68, of Dubuque, Iowa, passed away Thursday, December 21, 2017 at UnityPoint Finley Hospital in Dubuque. Visitation will be from 4-8 pm Friday, December 29, 2017 at the Egelhof, Siegert & Casper Westview Funeral Home and Crematory, 2659 Kennedy Road. Funeral Services will be at 10:00 a.m. Saturday December 30, 2017 at the First Congregational United Church of Christ, 255 West 10th St.
Liz was born December 22, 1948, the daughter of Delbert and Kathryn (Kennedy) Birdsell. Liz attended Sioux Falls Lincoln High School and was the first graduating class at the new school in 1967. Liz went on to earn her BA in English at Black Hills State College. On January 24, 1970 Liz married the love of her life, Max Corey, in Spearfish, South Dakota. Liz had many hobbies including cross-stitching, crocheting, or making her famous caramel bars, chocolate chip cookies, and banana bread for her family and friends. She was a die-hard Cubs fan. She will always be remembered as a woman who was determined and a person who spoke her mind and let you know how she felt. She was a resilient woman who endured through many illnesses in her life, including paralysis of her left arm and leg. Through physical therapy and the support of her family, she was able to continue to do many things she loved and lived a happy life. Those left to cherish her memory include her husband and primary caregiver, Max Corey of Dubuque; her children, Joanna (Chad) Lochner of Davenport, IA; Trent (Rachel) Corey of Vancouver, WA; Beth Corey and her husband, Steve Green, of Schaumburg, IL; brothers, William (Kathy) Birdsell of Burlington, IA and Ronald Swenson of Brandon, SD; grandchildren, Michael, David, and Brooke Lochner; Tyler and Jack Corey; Owen Green and one on the way, along with many nieces and nephews. She was preceded in death by her parents, a sister, Deborah Birdsell; a brother, Lloyd Swenson, and many aunts and uncles. In lieu of flowers, an Elizabeth Corey Memorial Fund has been established. The family would like to give a special thank you to the staff at Stonehill, the staff at UnityPoint Finley Hospital, and Dr. Cynthia Konz and staff. To send flowers to the family of Elizabeth N Corey (Birdsell), please visit our Heartfelt Sympathies Store.